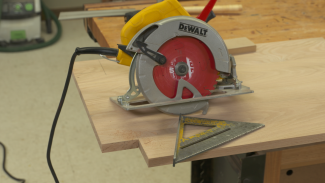 Shop-Made Circular Saw Guide: Cheap, Easy, and Awesome! 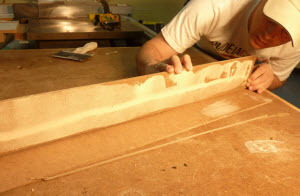 June 21, 2011 By Paul Mayer & filed under Jigs and Fixtures, Plans and Projects, Woodworking Projects. Working with big sheets of plywood, or worse yet MDF, can be a bear. Even on my cabinet saw, equipped with ample outfeed support, I dread man-handling those behemoth sheets. Its grunt work at best, and can be downright dangerous if the slightest thing goes wrong. I have stories among my circle of friends, and I will spare you the gory details. 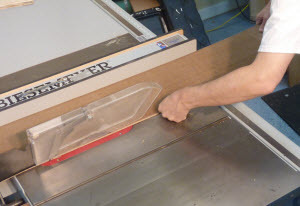 The solution to this problem that can be found in some big-time cabinet shops and home centers is a panel saw, which is an amazing tool for quickly, easily and safely taming sheet goods. 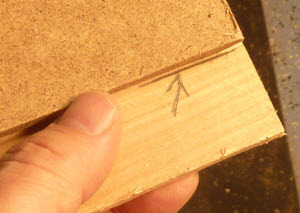 But two simple reasons prevent me and most other hobbyist woodworkers from taking the plunge into panel saw ownership. The first problem is price, and for me there don’t really need to be any other problems. At $900 for a basic model (and they go way up from there), I wouldn’t use it enough to justify the indulgence. Secondly, the dedicated footprint required for this tool is significant. Between the infeed space and the massive size of the tool itself, it is like having another stationary table saw for a specific task. These tools are impressive and a great asset for a shop, so if you have the space and the money, don’t let me talk you out of getting one. But if you are like me and don’t have one, the other or both, then read on. As I looked around for options for breaking down sheet goods in my home workshop, I saw that there are many nice guide systems for circular saws that looked decent. Some guide systems even come with a circular saw, and these look like a great alternative to a panel saw. I knew I was getting warmer. But could I rig something like this up for my own circular saw, which cost $49 some 15 years ago and had mostly been used for building decks? I love cheap, but I hate junk. 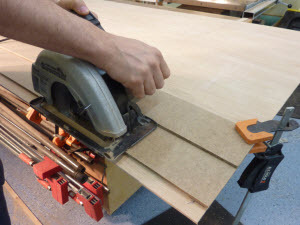 I wanted something that would deliver a chip-free edge on veneered plywood that would rival what a panel saw or high end guide system could deliver. If it compromised cut quality, I would go a different route. Cheap! I made two guides and had lots of material left over for about $13. Easy. Two guides took about an hour to make, and that included a coffee break. Zero clearance. The guides will prevent splintering on one side of the cut. Place directly on cut line. With many circular saw guides you have to accommodate the distance from the fence to the blade. Not here. Place the guide right on your cut line and go. Easy storage. These are super flat and durable. Drill a hole in them and hang them on the wall. If I have successfully sold you on the idea of building one of these, let’s get started. First, the shopping list is pretty simple. You will need a 4′ x 8′ sheet of 1/4″ hardboard and a bit of glue. That’s enough material to make an 8 foot long guide for ripping, a 4 footer for cross-cuts, and have lots of leftover material for future jigs. First, cut pieces for base and fence. 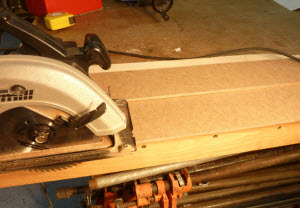 Cut a strip of hardboard 9″ wide and whatever length you want your guide long. The one I am making here is 8′ long. 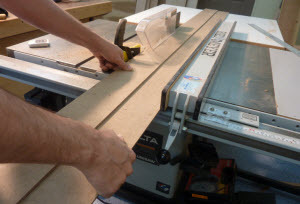 Then cut a strip of hardboard 5″ wide and the same length as the base, which will be used as the fence for your cutting guide. If you are tempted to keep the jig lighter by making the fence more narrow, be careful because the width adds rigidity which is critical for an accurate cutting guide, and it also provides more surface for clamping so that the clamp does not interfere with the circular saw operation, (I just saved you having to throw away your ‘rough draft’ project like I did with mine). Glue the fence to the base. 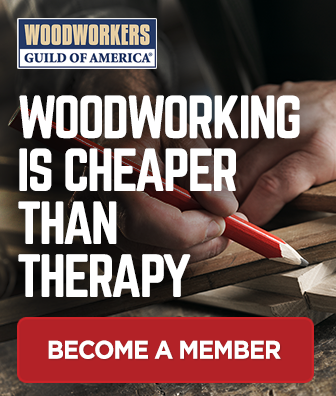 Use your favorite woodworking glue. Align the edges, but don’t worry too much as we will trim it later. Place glue-up on flat surface and add weight to hold flat. This will keep the cutting guide flat as the glue dries. As an alternative to weighting it down, you might choose to use short brads to secure the two pieces together. Whatever you choose, be sure to keep the pieces held against a flat surface while the glue dries. Cut base. Leave the edge overhanging enough so that your saw blade will not cut into anything that you don’t want it to. 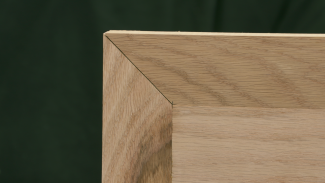 Hold your saw base carefully against the fence as you make this cut, leaving you a base that is perfectly matched to your saw, with a zero clearance edge that will deliver a chip-free cut on veneers. Trim the other edge. This is an optional step that will tidy up the guide. Place the non-fence side of your base against the fence on your saw, and adjust the fence so that you will remove material from both the base and fence of your guide for the entire length of cut. After this cut, the jig is complete. Place guide directly on cut line. 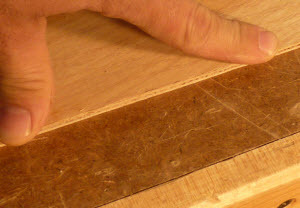 Mark the plywood for your cut. Then lay the guide directly on the line, placing the guide on the side of the line that you will keep. This will prevent chip out from occurring on the project itself, because the base of the guide system will serve as a backer board for the cut. Clamp the guide in place. Place the clamps where they will not interfere with the path of the saw’s motor. Make your cut. Carefully hold the saw tight against the fence and flat against the base for the length of the cut. Push steadily through the cut in one continuous motion. Perfect edge. If everything was set up correctly, your sheet should be trimmed perfectly to size, with a chip-free edge where you made your cut. Blade selection. 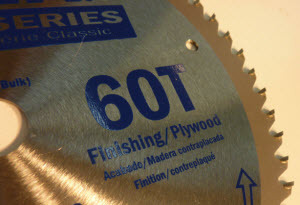 Be sure to find a good blade for cutting veneer plywood, and not just go with the junky blade that came with your saw, which is typically designed for cutting framing lumber. Look for a blade with a high tooth count, in the range of 50-60, thin kerf to minimize resistance as you move through the cut, and carbide tipped teeth to maximize the time span between sharpenings. Thanks for the comment. I like the concept of a double sided jig. 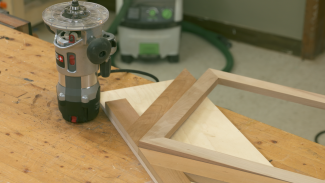 Because I only use this by placing the jig on top of the “keep side” of the plywood, thin vs. full kerf doesn’t make a difference like it would if you place the jig on the waste side. 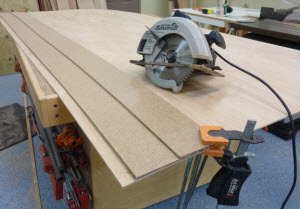 Another reader made an off-line suggestion to me that the other side of the jig should be used as a router guide for making dados, which I think is also a fantastic idea. I have a couple of these guides that I’ve used for years for my saw and router. I use one to cut off doors for floor or carpet clearance with no chipout. This is a great jig. I like the 1/4″ thickness better than the 1/2″ I am currently using. I gave mine a couple of coats of clear spray paint and then a good coat of paste wax to make it slick. great idea to lacquer and wax the guide, Steven. Great idea. I’ve been using a 4″ strep off the edge of a peice of 3/8″ ply nd allowing its placement by deducting the width of the of the saw plate. Thanks for the comment. That is exactly the way that I had been doing it for years as well. You will love this new approach for two reasons. 1) put the jig right on the line and cut. super simple. 2) the “zero clearance” aspect improves the quality of cut tremendously. Even with my cheap old circ saw and a home center quality blade I get chip free cuts on veneer. Love it. I’ve made these as well, they work great. Just had to make another as I switched to a thin kerf blade so there was a gap between the blade and my previous jig. Fortunately they’re cheap and quick to make. Thanks for posting. 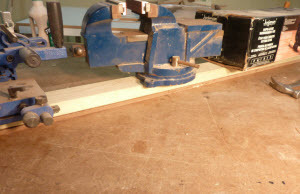 If you place this jig on the “keeper side” of the project, and place the wider portion of the base on the track, then the thickness of the kerf should not effect the cut. If you place the jig on the waste side, or place the narrow part of the saw base on the track, then you would need to account for the thickness of the blade, which would be a pain. So if you build another one, when you cut the jig with your circular saw, be sure to position the saw so that the inside edge of the saw blade (the edge closest to the motor) is defining the width of the jig; not the outside. 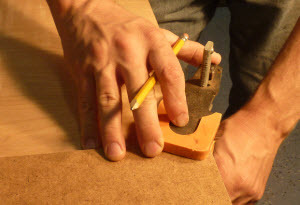 Use one side as above and flip it around and use on the other side a straight bit in your router and use it for doing a straight edge and jointing. It works great! I think 1/2″ MDF would work but would be overkill. My only concerns would be 1) weight, and 2) clearance. This might not be a problem for some saws, but if the upper guide was 1/2″ on mine, the saw would not fit flat on the base because the clearance underneath the motor is not sufficient. If yours has enough clearance, it would be fine. Exactly why I’m making my second set from 1/4″ masonite. Toying with the notion of making a two-edged one to accomodate both of my circular saws, with a common center guide strip. Thoughts? That is a great idea. Some people have also made these to accommodate a circular saw on one side and a router on the other. These are great guides. On the shorter one, I like to add a true-squared 3/4″ edge to the underside so as to help set the guide square for the cut. A variation on the idea noted by other commentators, who suggest using the non-saw edge for routing applications, is to use that edge for non-motor side of the saw guided cuts — the saws have right-handed or left-handed blade visibility and sometimes I have situations that force me to cut in an opposite-handed position, so having the other edge set up can help. Also as others have pointed out, the non-motor side edge guide IS blade specific. I like to have my non-guide supported side of my saw’s base be supported, so I either use double-sided tape to stick a strip of the hardboard to the saw’s base, or fabricate a custom base for the saw that accomplishes the same thing but is easily installed and removed from the saw. That blade specificity situation holds true for router bits too unless one lays out router lines based on the dead-center of the router base and calculates the base’s radius into the layout. Thanks for the great suggestions, Jack! I like this. If you really care for safety, to avoid possible kick back, I suggest to put this on rail/sliding system. Can I substitute masonite with another material? What would you recommend to keep that straight edge? Another material could be used as long as it is rigid enough to remain straight. To keep the edge straight, use good solid straight edge to begin with. A steel stud works well for this and is inexpensive to purchase. I thought a true plywood blade had a tooth count of 120. Great jig!! VERY easy to both make and use!! This fence and guide looks like it will work. Until I make one for my cross cuts I can’t say much more. In this paragraph, “First, cut pieces for base and fence.”, should 8″ for the length of the guide actually be 8′ (feet, not inches)? If you don’t have room to bring home a full 4’x8’x1/4″ hardboard sheet from your local lumber yard or home center, ask them to use THEIR panel saw to cut you 3 – 9″ wide and 3 – 5″ wide strips, 8′ long. That gets you enough for three guides, plus a leftover strip for several No_Slack_Jack’s saw base support pieces, and you can fit them in most vehicles. The few extra bucks are worth it. Thank you very much! This is what I have been looking for! Very clearly presented! Can’t wait to get mine built. I am using my table say much more now that I joined your great organization. There was a video on this project that I viewed months ago but now, I cannot locate it??? HELP! I’ve read countless articles and seen even more YouTube videos on how to make your own circular saw cutting guide. I find it interesting, but unfortunate, that ALL state something like, “First cut an ‘x’ in. wide, 8 ft. long strip of 1/2 in. or 3/4 in. plywood to use as your guide.” There lies my issue. I need to be able to cut a straight edge for me to make my cutting guide…but I don’t have a straight edge to begin with! Ok, I went to Home Depot and got an 8 ft. long board of Selex cmpc Trim Board as this was the straightest thing in the big box. I used this Selex board as my fence, and the rest is history. Did anybody else think of this, and what was your solution? Thanks in advance. When you go to big box, have them rip strips as suggested. Mark the factory edges to use as the straight edge on your jig. That is one of the best set-ups of any I have seen. And it makes sense. Nearly every other guide is good for 1200mm or there abouts, this one handles 2420 sheets here in Aus.